Almost all global views of Neptune that you have ever seen before were taken when Voyager 2 was far enough away that the globe entirely fit within Voyager's field of view. 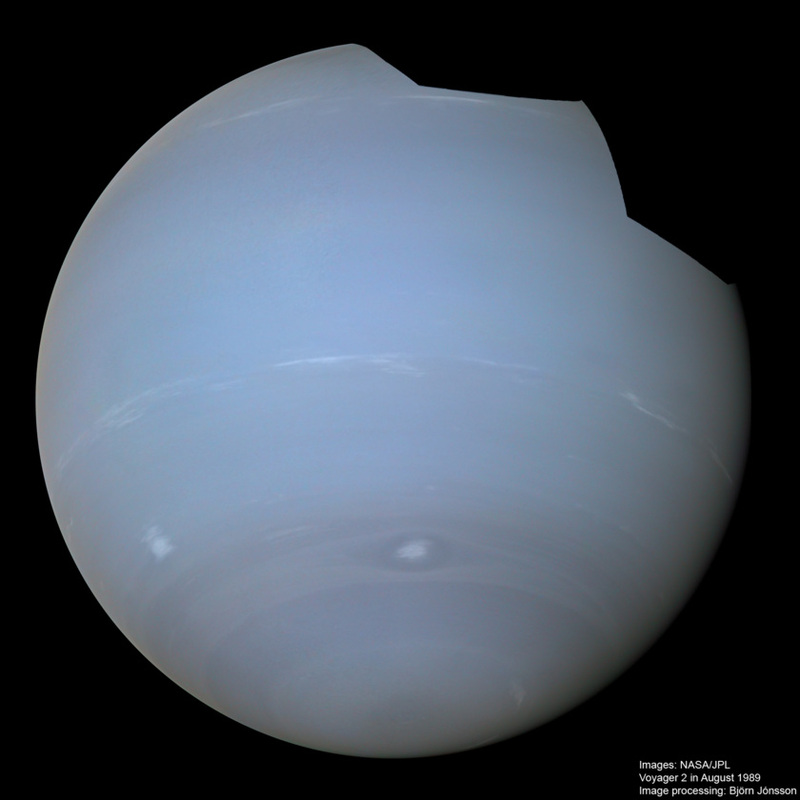 In fact, nearly every photo of Neptune in every book is a color composite of these three photos taken through violet, orange, and green filters. 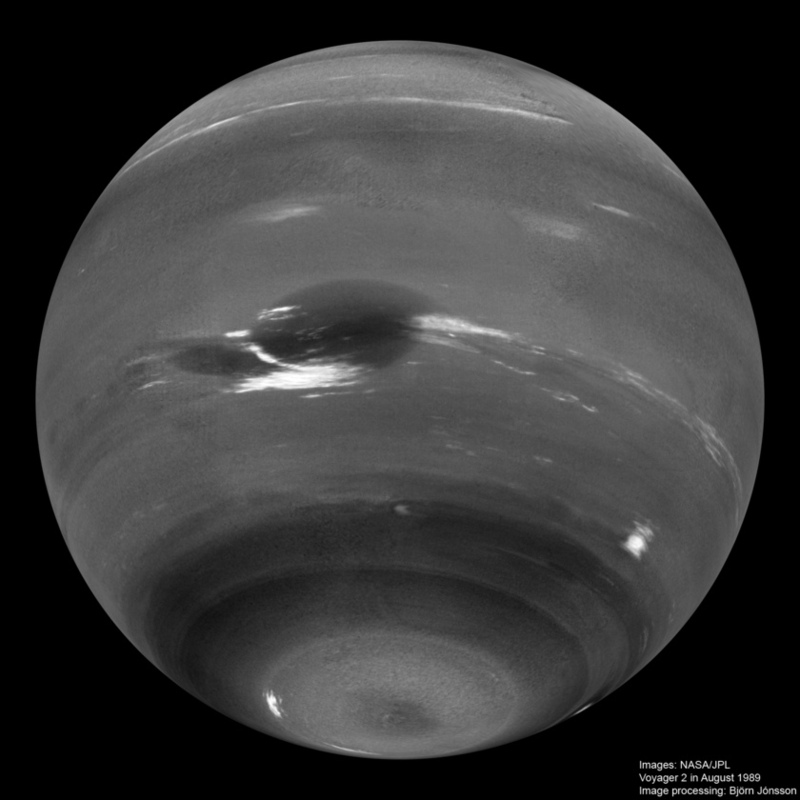 In these photos, great Neptune spans barely 750 of the Voyager camera's 800 pixels. To get a higher-resolution view, you would need to make a mosaic, assembling maybe a 2-by-2 or 3-by-3 array of photos covering the disk. That gets into rapidly increasing amounts of data: 12 images for a 2-by-2 mosaic, and 27 images for a 3-by-3 mosaic. Unfortunately, Voyager 2 could not acquire the data needed to make such a mosaic at Neptune, for a number of reasons. It was flying past the planet extremely fast, and Neptune rotates fairly rapidly (once in 16 hours), so shifts in perspective made cloud features move quickly from one frame to the next. But a bigger problem was that Voyager 2 transmitted most of its data to Earth in real time. At Neptune's vast distance from the Sun, Voyager 2 could only transmit one image every five minutes, so individual images could not be taken any less than five minutes apart. Even a 2-by-2 color mosaic would take an hour of Voyager 2's precious close-encounter time, and the data taken through those different filters largely redundant. Voyager 2 usually had to transmit everything to Earth in real time. At the low bit rates possible from Neptune's distance from Earth this meant a long time between successive images. 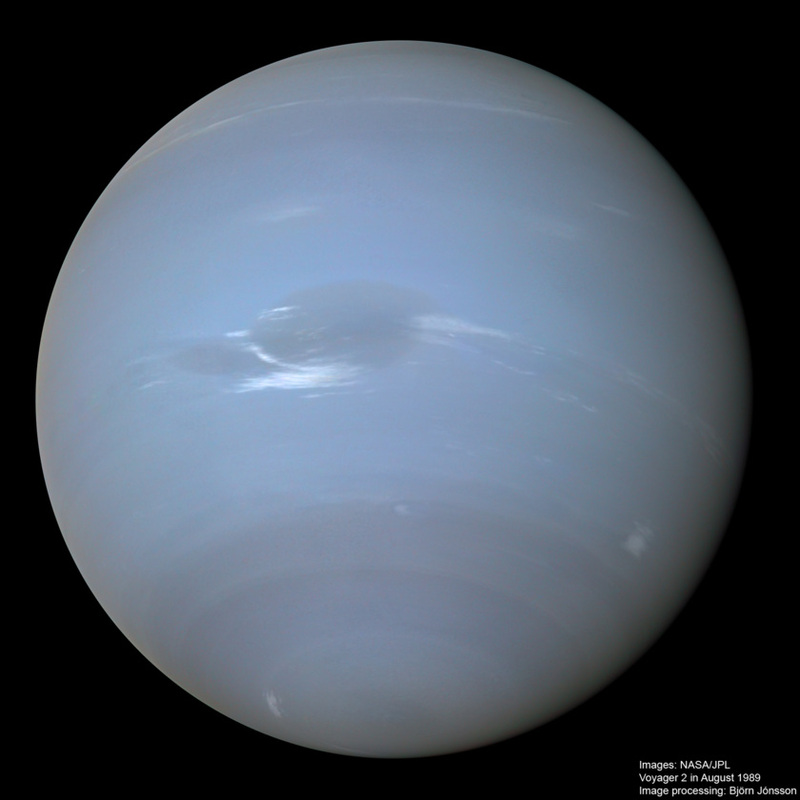 This makes assembling mosaics of Neptune difficult since the images that must be used are obtained over a period of many hours (or even a few tens of hours for big mosaics) and Neptune rotates fast. The best way for assembling big Neptune mosaics is to reproject the images to simple cylindrical projection as I typically do when doing mosaics of Jupiter or Saturn. But in addition I had to remove the effects of global illumination using an inverse photometric function when reprojecting the images, otherwise seams in the map can't be removed with acceptable result. In contrast, this is not the case when dealing with Jupiter or Saturn. I then assembled a mosaic in simple cylindrical projection and then rendered images of Neptune using the appropriate photometric function. This results in some photometric innaccuracies (the photometric function isn't 100% accurate) but despite this the resulting global images are much better than what one gets by using the source images directly, since the illumination conditions change fast due to Neptune's fast rotation. All of this was done in grayscale as only green and clear filter images were available. I used mainly green images since they had better contrast than the clear filter images. In addition to the complications mentioned above, some of Neptune's atmospheric features change very fast (especially the bright clouds) and also the rotation period (or zonal winds) varies a lot with latitude. Major features can drift over 60° in longitude during one rotation of the planet. Because of this the relative longitudinal positions of the cloud features are only approximate in the mosaics above. The final step was to colorize the grayscale renders. For that I used an earlier global true color image I assembled back in 2009 - it can be seen below. With all of the caveats above, the result is the highest resolution global mosaics of Neptune that I have seen. Most of the source images I used were obtained about 2 to 3 days before closest approach when Voyager 2 was 3 to 4 million km from Neptune. I used the calibrated and geometrically rectified images available at the PDS Planetary Rings Node. I used about 20 images. Here is his earlier color composite, from 2009. This new view of Neptune was created from images captured by Voyager 2 as it approached the planet at a range of more than 10 million kilometers on August 17, 1989. 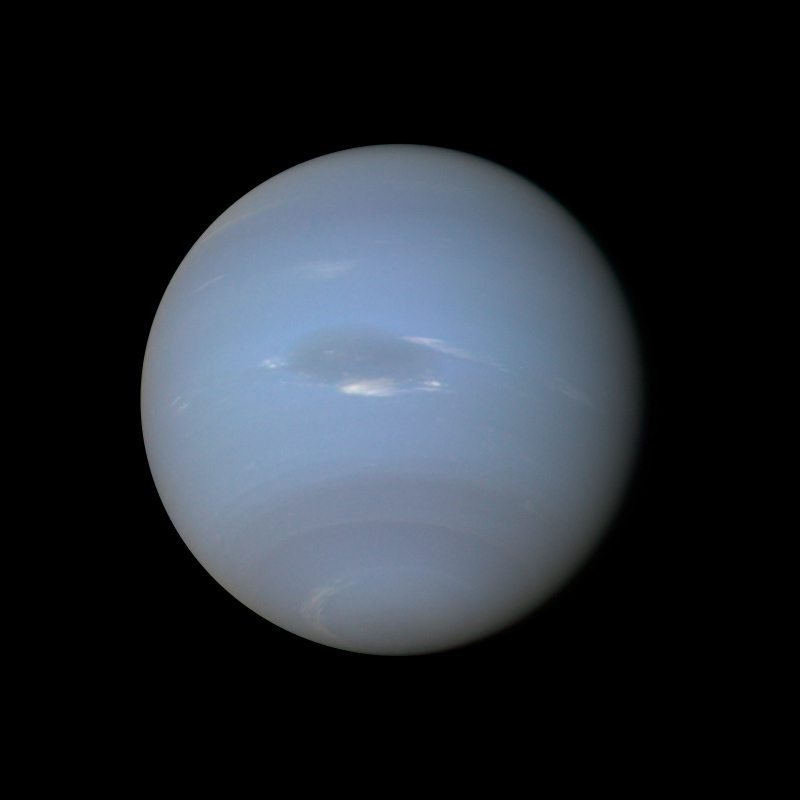 It was processed to present Neptune in approximately true color. The processing was complicated by the fact that 18 minutes separated the acquisition of orange, green, and violet frames, since Voyager 2 was transmitting data back to Earth in real time, and bit rates were very low at Neptune's distance from Earth. Today, ont he 25th anniversary of the Voyager 2 flyby, New Horizons finally passes the orbital distance of Neptune. There will be a special event on NASA TV to mark this milestone, from 1-3pm EDT / 10-noon PDT / 1700-1900 UTC. Wonderful Neptune！Nowadays massive features on Neptune can be captured by the large based ground telescopes such as W.M.Keck with AO. This will inspire humans to send an orbiter to see the cold planet more clearly~ thanks,Emily! The high resolution, contrast enhanced black and white image hints at a giant hurricane at the pole. I am anxiously awaiting to see if Juno sees a similar feature at Jupiter. Along with Saturn these polar storms may be the norm on gas giant planets. From the best images I've seen, Uranus seems to lack a polar storm at it's pole. Great anniversary commemoration! Thanks Bjorn and Emily! Kim: perhaps the orientation of spin axis is relevant? Near-alignment with orbital axis allowing (inducing?) polar storms? @Xiaosi Zhou I am afraid that I have never even heard of an orbiter to Neptune being proposed. Don't wait for that to happen within the next 50 years. But Uranus is seriously proposed again and again and probably will happen. Only 3/4 of the distance to Neptune, but more than 5 times the distance to Jupiter, and it takes Juno 5 years to reach Jupiter orbit. A realistic hope is to send specialized nanosats on fast fly-by missions. Many of them to all kinds of targets.